Similarly, when this happens I also cannot click the 'Cancel' button to close the snippet editor, although this does not show an error in the console. The snippet editor itself still functions correctly in this state. I can edit the code and run it as normal. My only course of action when this happens is to refresh the page and try to edit again. I have not yet managed to reproduce the issue with certainty. I originally believed this happened when the question was edited by someone else, but I have had it happen when no other edits were made. I also surmised that it could be a timeout or permissions issue, but the edit that caused the above error took me no longer than 30 seconds. For reference I am using Chrome 68 on Win10. This has happened on older versions of Chrome too. I haven't tried it in other browsers. 2018-09-06: Twice while editing this question. Had to open a new tab and copy over the snippet edits both times. 2018-09-20: Editing this question. Again, had to copy between snippet instances in different tabs. 2018-09-21: Answering this question. First presentation I've had of this bug when answering a question. The other two 'ERR_BLOCKED_BY_CLIENT' errors would appear to be unrelated and instead caused by my adBlocker. I figured out the source of the problem. 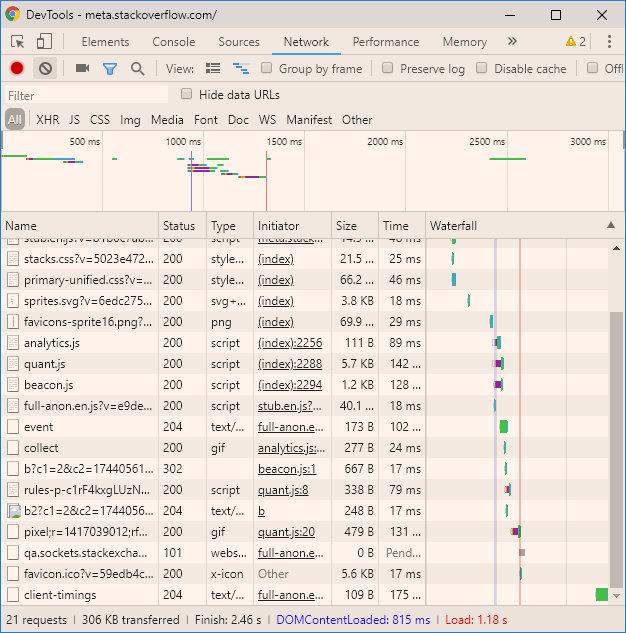 In short: it occurs when you click rapidly after opening a snippet for the first time, before the snippet framework HTML has had a time to load. Clicking triggers a listener which expects the snippet HTML (and associated data) to be loaded. An error is thrown, and further JS execution stops, preventing you from saving / canceling the snippet to get back to the question/answer box. It's pretty reproducible if you try to make it happen deliberately and live more than a few milliseconds away from the servers. I think the purpose of the original rule is an odd way to have clicks outside the .snippet-holder (that is, clicks on the dark rectangle on the edges) trigger the modal-closing mechanism. If you override the rule like this, you'll have to click on the Save or Cancel buttons to exit the snippet editor. The first time you click on the <> button to create a snippet, or when you click on "edit the above snippet", the site makes a network request to /snippets/editor-ui to get the snippet modal's HTML. Two elements immediately appear as children of the <body>: a lightbox <div class="lightbox" ...</div> and, on top of it (with z-index), a <div class="modal snippet-modal ..., which gets populated with the snippet HTML once the network request resolves. Once the network request finishes, this .snippet-modal gets populated by a child, <div class="snippet-holder">, which has pointer-events: auto;. But, this means that before the request finishes, clicks on .snippet-modal will instead be registered by (have an event.target of) whatever element's behind the .snippet-modal, which is the .lightbox. But if the snippet HTML hasn't come back yet, the loadEditorInnerHtml Promise hasn't resolved yet, so snippetPopup.data('_snippet') returns undefined, and undefined.save() throws the error. Lots of ways to fix it, but that's up to the devs. Not the answer you're looking for? Browse other questions tagged bug stack-snippets editor .